Adam Platt of New York Magazine recently identified his list of favorite New York City restaurants, including the best chefs. Among the Italian-American restaurants on his list is one of our favorites: Torrisi Italian Specialties, where Chefs Mario Carbone and Rich Torrisi create a first-class, sit-down dinner for only $50.00 -- if you have the time to wait in line. As Platt notes, for dessert, Torrisi's selection of Italian cookies "are served the way Little Italy grandmas like to serve them, on tiny plates of floral patterned china." The sweets, including out-of-this-world torrone are all created in-house. As a New York Times food critic recently wrote: The Italian cookies and mini-cannoli served at Torrisi are the kind “you can still get on Arthur Ave. in the Bronx or along Court St. in Brooklyn, only approximately 22 times better in quality here.” Platt names Carbone and Torrisi as the Best New Chefs in New York. 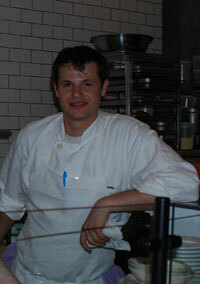 Torrisi, located at 250 Mulberry St., makes us proud to be Italian Americans! 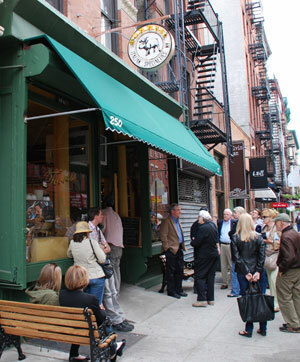 As Platt notes in his article, these days "Nonna's old fashioned, home style cooking is the defining style in Italian food.” He points to Osteria Morini, on Lafayette St. and Maialino on Lexington Ave. as examples of authentic Italian cuisine. The veal-and-pork ragu' at Osteria Morini, "tastes like it was transported from some intimate back-room kitchen in Bologna," he writes. Maialino, on the other hand, is a "facsimile of a traditional Roman trattoria." We're looking forward to eating at these two restaurants. For tasting menus ($125 for 7 courses), Platt likes Mario Batali's "newly aggressively opulent fine dining palace Del Posto." We would expect nothing less from one of the best chefs in America! If you're a true carnivore, Mario's new restaurant, Manzo, is also among the city’s best new restaurants. As Platt writes, Manzo "represents the apotheosis of high-end nose-to-tail beef eating in New York.” Manzo is conveniently located in Eataly, the gastronomic paradise for lovers of Italian food, partly owned by Batali. For a great dessert, go to Lincoln Ristorante where pastry chef Richard Capizzi serves Frittelle di Mele, or as Platt writes with a certain gusto, Capizzi "crowns this impeccably turned ode to the apple fritter with a scoop of caramel gelato."